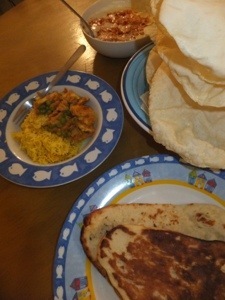 Tonight’s dinner was pea and paneer curry. We had special guest Bob join us for dinner tonight. He was in town visiting his family. It was lovely to see him again. Dinner was off to a shaky start though, as I opened the packet of tomatoes (I wouldn’t normally buy pre packed tomatoes, but it was all they had at Coles) all of them were rotten. 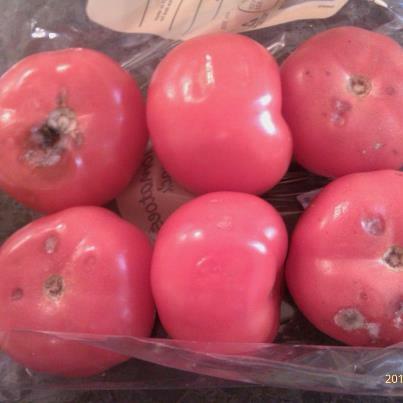 I did take a photo of them, and I will put it up here, just to show you the quality produce available at Coles. They weren’t cheap either – nearly $7. I decided to quickly go and return them to my local Coles (a different one than I bought them from) and much to my horror ALL of theirs were rotten too! Geez. They had a different type thought, so I ended up swapping for them. ANYWAY, dinner was good and tasty. 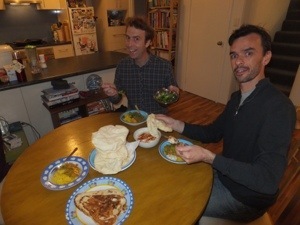 Bob and Steve enjoying their curry.